It's important to understand the names of various parts of a book. That way when you get a cryptic message from an editor or publisher, you know what they are referring to. 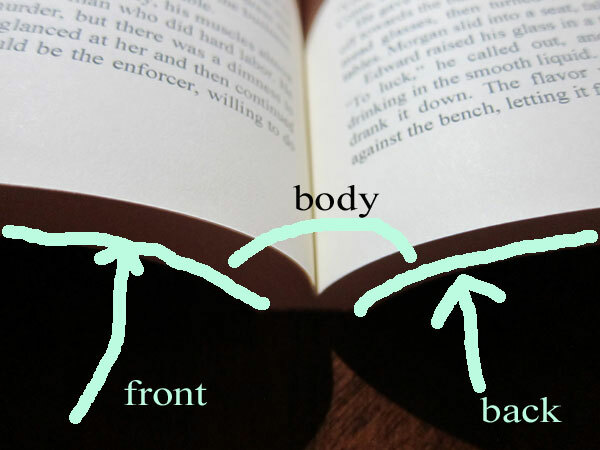 Here are the parts of a book, and what they mean. First off, a book's content is divided in general into three sections. There is the front matter, the body matter, and the back matter. As terms can be confusing to describe, I've made an admittedly rough but hopefully serviceable image. To be general, the front matter is the "stuff" that comes before the main body of your work. So this is where the title page, copyright page, and other similar content goes. It is the preliminary information that leads into your book. The body matter is the main content of your work. Often it's divided up into chapters or sections, depending on how you wrote it. The back matter is then whatever comes after that. This is often where an "about the author" page lives, or a glossary, or perhaps an appendix or two. So, with those main categories of information laid out, let's look more closely at each area. In general, the front matter area should NOT have page numbers. If you have a long section of front matter, for example a long preface, you might want to number that with roman numerals (i.e. i, ii, iii, iv, and so on). For most pages, however, this area is unnumbered. Title Page - I highly recommend all books have, as their very first page, a title page. This helps ensure that the book the person has is actually the book they want. Yes, there are cases where someone accidentally loads the wrong "insides" to go with a given book cover. By showing the title of the content right there on the first page, you reinforce to the reader that they are in the right place. The title page should have the main book title, any subtitles, and the author name. Colophon - I call this the "copyright page". This is usually on page 2, i.e. on the first left-hand page and on the back side of the title page. This is where the copyright details, the ISBN number, the cover design credit, the printer's key, and other similar details go. Table of Contents - I tend to only use these for non-fiction books. I don't figure that someone reading a fiction story will feel a need to flip "to Chapter 12" most of the time :). Dedication - If you are dedicating the book to someone, it is customary for that information to go on a page of its own, at the front of the book. The page is purely optional. Acknowledgements - This area gives thanks to the people who helped and inspired you when creating the book. This can go at the front or the back. Again, it is purely optional. Epigraph - A short poem or saying that relates to the material to come. I tend to enjoy having an epigraph on page 3 of my book. To me it helps to set the tone for the book. I write these myself. They are short blurbs that relate to the emotions to come. If you us someone else's words, be sure to consider copyright issues. Half Title - A half title is JUST the main title of the book, and it is shown as a way to prepare the reader for reading, in sort of a "here we go" way. It should be on the right side. So in my books this comes on page 5. The body matter is the main content of your book. In my fiction books, this area is broken up into chapters. In my non-fiction books, this area is broken up into sections. Either way, you want to aim for each chapter / section to begin on the right hand side. "Actual" page numbering, with Arabic numbers (1, 2, 3, 4) begins in this area. I'll note that some guides put the Prologues in the front matter area, rather than here. They put the Epilogue in the back matter area. I disagree with that. To me, a prologue and epilogue are parts of the story. They're merely separated out by time gaps. There are many published novels which agree with me on this. For example, L. A. Confidential by James Ellroy starts with a Prologue, and the page numbering begins there with page 1. It then goes right into Chapter 1 which is now on page 9. So it's all considered one long story. Similarly, The Da Vinci Code by Dan Brown begins with a Prologue. The page numbers of the Prologue go right into the page numbers of Chapter 1 in an unbroken string. The back matter is the ending area of the page set. This comes after the story has ended. All of this information is optional, although I do recommend having the first two. About the Author - especially with ebooks not having an actual "back cover", this page can be where the author's photo and bio is provided. Other Books by the Author - A great way to cross-promote any other things you have written. In ebooks, make these linkable to a page where a reader can learn more about them. You can even provide a sample chapter of the other work, to draw the reader into buying it. Appendix - Supplemental details on the material covered can go in here. For example, a novel about the Civil War might have an appendix which covers some of the historical details. Glossary - Any special terms or words used in the book can be explained here. Bibliography - If you used a number of books to provide reference material, this is a good place to list them. Index - This is the way to let readers know where to easily find certain topics. For example, in my Sangria book I provide an index by fruit type. That way someone who has oranges on hands can easily find all recipes that include oranges in them. Acknowledgements - I prefer to put my acknowledgement information at the back. There are of course a myriad of other pages and information that some authors choose to include. Let yourself be imaginative! To give a visual of the beginning of a book, here is an example from one of mine. You start with the Title Page on the right. Then the Colophon (copyright page) on the left. Next is the Epigraph on the right. A blank page, and then the half title on the right. A blank page, and then the Body Matter, in the form of the Prologue, begins on the right. The first page is unnumbered, and the second page of the story is labeled with a "page 2".